If we were to group expats into a single country called Expatland, it would be the 5th largest country in the world. Currently inhabited by 244 million people, it is growing quickly at a rate of 300,000 new expats per month. In many instances, these 244 million people don’t just move to a new country once. Some choose to live in multiple countries throughout their lifetime. But, no matter how many times they do it, the process of moving countries is never straight forward. The global finance and banking industry impacts how expats transact, remit money, save and invest. Before considering a move there is a considerable amount of financial planning that needs to take place. Setting up bank accounts, applying for mortgages, getting insurance and budgeting to name a few. That’s before you even think about the exchange rates and the impact they may have. However as technology advances, so do the facilities available for expats to make this process easier. It also goes without saying that said advances are also providing more jobs and opportunities for expats around the world too. There are now ‘fin-tech’ corporations that are using technology to improve financial services, such as simplified bill payments, more efficient access to credit or borrowing, mobile only banking as well as reward programs for expats. 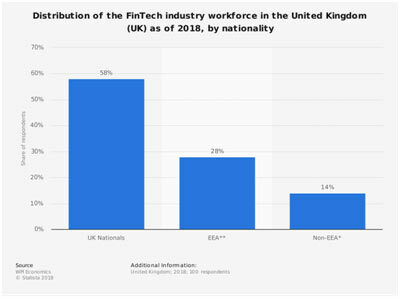 The above statistic illustrates that approximately 42 percent of the UK’s FinTech workforce are non-UK nationals. Thus meaning that UK FinTech firms rely heavily on having expats as an integral part of the workforce. New York is highly regarded as the finance capital of the world. The infamous Wall Street is home to the largest investment banks and nearly every large global financial institution has a presence there. London is also up there is in the popularity stakes however due to the political climate in the UK at the moment, many believe that it will lose its popularity by 2023. Hong Kong, Tokyo, Switzerland and Germany are also front runners but if you are considering move, Singapore could be a good choice. Singapore is crying out for skilled Tech & Software workers. A recent study showed that 53% of FinTech companies said they were struggling to hire talents in this area. Before you consider relocating, it’s important to look at the structure of the economy in the country you wish to move to as well as the differences in culture, language and compensation. Salaries can vary drastically according to country and cost of living. The success is all in the preparation. Where tax is concerned, failing to plan could add thousands of dollars to your liability, with potential hits in your native country as well as your host country. With proper tax management, you can get the best outcome possible. Protecting your finances, you can reap the rewards of a new lifestyle – and potentially open the door to serial expat adventures. Competition for jobs in the traditional financial sector can also be notoriously high. Last year it was reported that expats in Hong Kong only got 15% of finance job placements, down from 40%. With some finance positions it is essential that you invest yourself in it completely and are prepared to put in the time and dedication to prove yourself. Therefore if you are an expat in this sector it’s essential that you choose to move somewhere you can see yourself for a long time. How Expatland can assist Fin-pats. Our mission is to make life easier for expats on the move. It’s essential to plan, understand the challenges that becoming an expat presents, and get the professional consultancy you need. You will stand a far better chance of success with advice that without expert support, expat dreams often end prematurely. When international relocations fail, the cost can be steep, personally, professionally and financially. We bring Expatland to life through Global E-Team networks.E-Teams are a special group of service providers based in the city you are moving to. They deliver all the help you need in one place. We have E-Teams covering highly reputable tax advisors, currency exchange, business tax support, mortgages, insurance and pensions.